Fascinated by the vast landscape of the post-wall transition and with the Graham Foundation's sponsorship, we embarked on this ambitious documentary project. 170,000,000 people reportedly live in the communist-era housing of Eastern Europe and Russia. We wanted to record and make some sense of these deeply ideological architectures, their massive scale, the entropic breakdown of the society that produced them, and the industrious (and no less strange) capitalist makeover that was taking place on the same vast scale. We visited housing districts of Warsaw, Prague, and Belgrade to record this landscape in transition, aesthetically awesome (in all senses of that word): brutal, relentless, and nearly beautiful on its own terms. We titled the project "The Architects of our Happiness" after a mock documentary imbedded in the 1971 film Man of Marble by Andrzej Wajda. This fake documentary recorded the construction of the new industrial city of Nova Huta and the labors of a fictional Polish shockworker, forming the most important and visually most striking part of Wajda's film. Precisely mimicking the newsreel tableaus in its camera angles and, most importantly, in the enthusiastic tone of the voiceover, Wajda created a piece that could have been easily mistaken for an authentic newsreel of the period. We felt that the reference and motivation we found in Wajda's film for our own project immediately placed us in the middle of the complex world of housing estates located in all major Eastern European cities, and alluding to the history of a documentary discourse about them. 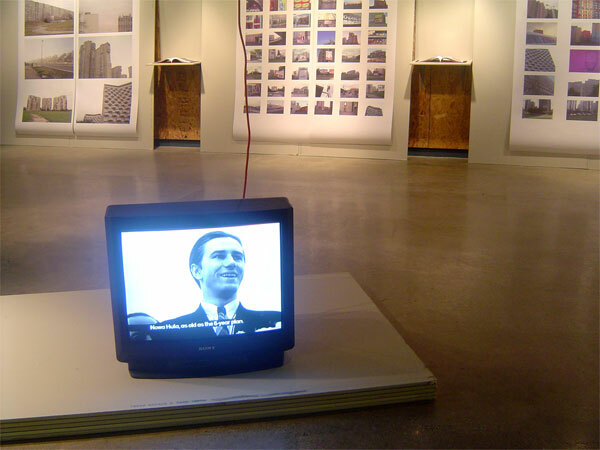 Our documentary research was presented in the gallery of the A. Alfred Taubman School of Architecture at the University of Michigan in February 2006. We organized our findings into six categories of phenomena. 170,000,000 contained large architectural formations, building configurations, and the sky figured between them. Pazi Metak! which in Serbian means "Watch out for bullets," contained all the open spaces we found between things, some considered, some not. The name for this section came from a billboard we found in one of the open spaces of New Belgrade in Serbia, which just before New Year's Eve reminded inhabitants of one of the functions of the open spaces between housing. Pastels concentrated on the hues and contrasts we found, it included the greys of Belgrade and the newly insulated (with dryvit) and freshly painted (formerly grey) housing stock from Warsaw and Prague. The category Good Year was constituted out of all kinds of commercial language, oversized, profane, loud, that was not initially planned and installed in the housing districts we visited, thus still a bit awkward and surreal when we recorded it. 11Jan was a category that collected all the small events and traces of daily life in the housing districts. And lastly, Eye Sore was a Super 8 film we produced by taking a single shot every time we saw Houston, Texas, in our Eastern European cities.